"The people will bring darkness...upon themselves." Presidential elections bring out the best and the worst in people. Many people appreciate the ability afforded to them by having the right to vote and other people prefer to impose their views on others. Finding the best candidate is never a perfect science, but there are some more qualified than others. 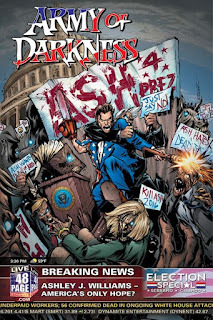 Ash in Army of Darkness: Ash for President #1 from Dynamite Entertainment is one such candidate. The issue is written by Elliot Serrano, illustrated by Deigo Galindo, colored by Pete Pantazis and lettered by Tom Napolitano. He’s faced off against demons in Hell. He’s battled the dead in the future. He’s even combated the armies of darkness in space. But Ash Williams has never gone up against evil in an arena like this: the political arena! When the Necronomicon Ex Mortis gives him a cryptic message, Ash Williams enlists the help of a beautiful psychic to help him track down the agent of The Great Darkness, an evil so great that it threatens both humankind and the demon realm. But what happens when the search for truth takes Ash on a trail that he never expected… the campaign trail? The 2016 Presidential election is definitely unique in the entire three-ring atmosphere enclosing it and Serrano taps into that frenzy effectively. There's clearly some pent-up frustration in the issue that reflects the sense of the current moment and Serrano channels that to make the book a fun read. Ash has gone against all manner of undead characters and creatures and Serrano essentially characterizes the political candidates as such. Serrano's script is very entertaining and captures the essence of what makes Ash the likable rogue that he is. And the issue is a one-shot, but Serrano wraps everything up pretty neatly and offers an interesting outcome that certainly a small subset of the population wouldn't have a problem with. Ash has a very familiar look to him thanks to the movies, television and comics all of which Galindo taps into for rendering Ash in Army of Darkness: Ash for President #1. Galindo manages to work in many of Ash's familiar facial expressions, most of which revolve around some sense of disgust or disbelief at what's happening. Most of the panels are positioned against empty gutters which allows the action to stand out better and Galindo throws in plenty of action. Galindo's illustrations are pretty cartoonish in nature and are a good fit for the subject matter itself. Pantazis' colors are largely primary and further that cartoonish flair. Army of Darkness: Ash for President #1 is a pretty fun one-shot that gets everything right about Ash and the Evil Dead universe. Ash would make a great Presidential candidate when backed by the Necronomicon Ex Mortis and the characters in that universe might be better off anyway. Serrano draws upon the prevailing sentiment surrounding the 2016 Presidential election in that neither candidate is really ideal in the minds of voters. Galindo's artwork is clean and lighthearted, bolstering the generally whimsical approach taken by the characters. Army of Darkness: Ash for President #1 is a really entertaining book that poses an equally amusing what if scenario. Army of Darkness: Ash for President #1 is in stores now.